SCOTTISH WORKERS BETRAYED BY SALMOND AND THE SNP. PALESTINE CONTINUES TO SUFFER ISRAELI OPPRESSION AND IT'S CHRISTMAS. NO CHANGE THEN. Further evidence of snp duplicity and hostility to the trade union movement arrives just in time for the beginning of referendum year. Not that any was needed but this is special, the Scottish government announced that it would legislate against companies who blacklisted Scottish trade unionists and employers who employed Scottish workers on zero hour’s contracts. Unfortunately it was discovered that some large companies who are close to the snp will be exempt from that legislation, yes you heard that right, companies who are friends of the snp will be able to continue blacklisting Scottish trade unionists and employing Scottish workers on zero hours contracts with impunity because salmond and the snp have decided that their friends will not be subjected to the same rules as everyone else. If this is not blatant anti union bias I don’t know what is. The snp for all their bluster have never been able to make a breakthrough with the trade union movement and the hatred that that has generated from them to the unions is palpable because of this. Grangemouth provided a glimpse of the real face of the snp when salmond demanded that the union members should in fact surrender to Ineos. He called on them to accept cuts in wages and pensions, a two tier workforce, poorer conditions and a guarantee of a no strike agreement, he deliberately took those union members back a hundred years, it was the act of a vengeful traitor. Now he provides immunity for blacklisters and exploiters of labour. This man and this party are no friends of Scottish workers, unions would be discriminated against under an snp separate Scotland of that there is no doubt, they would be trampled under the snp jackboot as the snp took the side of management against them to settle scores because of their support for Labour. Scotland would become a country of cheap non unionised labour and a haven for tax dodgers. As 2014 approaches I am pleased that the political pendulum is swinging back to Labour and pleased that that applies to Holyrood, Westminster and the independence laugharendum, the NO campaign is rock steady and has maintained a steady and massive lead over the yes camp for well over two years now and I expect it to turn in to a complete rout and humiliation for salmond and the snp crazies. The behaviour of the separatists is set to worsen as the car crash nears and I confidently predict civil unrest by some of what we used to call the “bampots” in the loony wing of the snp, the streets will not be safe for anyone with an English accent and we can only hope that the “Polis” are ready for it. At this time of year I always ask people and I do so now to think of the “little town of Bethlehem” and let it remind you of those worse off than ourselves as it nestles on the west bank of the river Jordan in occupied Palestine. A place where inhabitants are surrounded by tanks, barbed wire and check points by the inhuman and brutal bully that is Israel. Offer up hope that it will someday be restored to peace and its people and all the other Palestinians under siege will be granted their dignity and human rights. NKOSI SIKELEL' iAFRIKA - GOD BLESS AFRICA. 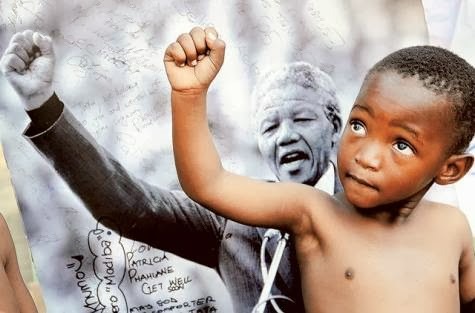 SOUTH AFRICAN ANTHEM - MANDELA R.I.P. It is impossible to not think back over the life of Nelson Mandela on hearing of his death. My own involvement with South Africa goes back 45 years or more to the time when I was a teenager and a fledgling activist looking for good causes to support. South Africa was a place we knew very little about because it was an embarrassing secret to so called western democracies that were up to their elbows in it through investments. Slave Labour is one of the purest forms of capitalism there is and that was what provided the rich investment opportunities. It also provided a great standard of living with well paid jobs and all you had to do to get your share of this was to have a white skin. The whole stinking edifice was held together by that most inhuman brutal system called Apartheid, unparalleled in its evil and depravity. That so many seemingly nice decent people, (relatives anyone?) Yes it’s a horrible admission isn’t it, were able to go there and make themselves a comfortable living is a horrible reminder of how frail our human condition really is. The Jewish Americam writer Hannah Arendt coined the phrase “The banality of evil” to describe Adolph Eichman when reporting his trial for war crimes and that sums up South Africa under white supremacist rule as they enjoyed the wages and lovely houses provided by the black population who were treated like beasts of burden. Now of course we see the disgusting spectacle of those who wanted Mandela not only to lose but to be executed declaring their admiration for him. Head of that list is the revolting and amoral Margaret Thatcher who declared him a terrorist and vehemently opposed sanctions against apartheid South Africa while conveniently forgetting to mention that her equally wretched husband Dennis had considerable sums of money invested in that corrupt and evil system, as did churches, The city and pillars of our superior society. Cameron was also an enthusiastic opponent of Sanctions as was Tebbit and the rest of them, a more thoroughly dishonest and revolting bunch would be hard to find in history’s pages. To take on these circumstances and triumph was one of history’s greatest achievements and it is true in my opinion to say that without Mandela it would not have been done. His courage and dignity were quite amazing and he rightly became recognised as one of the greatest leaders in history. He was the mighty indestructible presence in the background as we marched and demonstrated and sometimes blundered our way through the Anti Apartheid struggle, I wonder how many times the South African White Supremacists must have bemoaned the fact that they did not just kill him when they had the chance. He became too big to kill and too well known to slip on the soap and fall down stairs in prison nor would the world believe a tale of suicide in prison, he became more powerful than those who jailed him. He was the inspiration for us and millions around the world. Glasgow was the first place to grant him freedom of the city, something to be proud of. I took my daughter Clare to see him in George Square as he thanked Glasgow for its unstinting support over the years, we were both young enough for me to lift her on to my shoulder to see him speak and then delight the crowd with an impromptu display of singing and dancing a precious memory for us both, as a delirious crowd embraced him while mother Glasgow poured down its relentless gentle rain, a memory she still talks about. He is quite simply irreplaceable but for South Africa there is no going back, the racist beast has been slain and so it must stay. There will be plenty of struggles ahead but they will win in the end and, as the legendary murdered American union man Joe Hill said “don’t mourn me, organize” Madiba would agree with that sentiment. 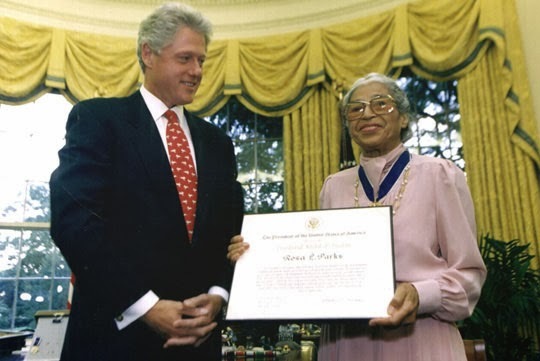 REMEMBERING ROSA PARKS, A TRUE AMERICAN HERO. Sunday saw the 58Th. Anniversary of an event that changed history and it was down to a small, poor, quietly spoken African American woman. She was of course Rosa Parks. She has now taken her place among the most revered people in history because of her courage, her resolve and her great dignity. Her refusal to give up her seat on the bus to a white man kicked off a series of events which would change America for ever, the fire she lit still burns brightly today, for proof of that you only need look at the White House and its incumbent Barrack Obama. The story does not need retelling by me but I will say that Rosa Parks took her place in history and she continues to inspire those of us who struggle for a better world. She gives hope as well as inspiration. The repellent racism which blighted America at that time and still does today was not eventually challenged by armies, it was extraordinarily challenged by a small black woman who was travelling home after doing a tiring day’s work as a seamstress, she let the genie out of the bottle and it will never now be put back in. Along with people like Mandela and Martin Luther King she has taught us that we should never give up, who would have thought that such a minor incident would go on to shake America and the world?. How many thought that white supremacist rule would ever be overturned in South Africa, how many thought that Mandela would die in jail and be forgotten and Apartheid would always be with us?. We all know now that one man did not give up despite the overwhelming odds and he, Mandela, inspires us still. 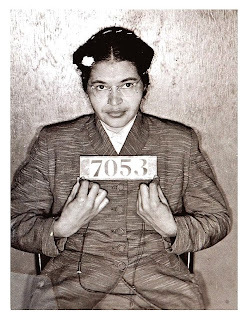 When you are ready to quit, when you are tired and exhausted, when you are losing hope, think of Rosa parks and carry on. Think also of the song we associate with her all over the world where people are oppressed and believe that right will prevail and that “we shall overcome some day”. IS THE GLASGOW HERALD PLAYING THE GAME WITH THE INDEPENDENCE DEBATE? READ THIS. The snp/separatist/cybernats have been questioning the veracity of the polls which have consistently told us for over two years that the yes campaign is heading for humiliation. They have constructed a lie around the events surrounding the Holyrood election of 20 07 which the snp won. It goes like this “the polls got it wildly wrong in 20 07 and they will be wrong again in September 20 014”. There is a big lie and a small truth in their narrative, the small truth is that the polls can get it wrong and the yes camp could win but, the big lie is that the polls did not as they claim get it wrong in 20 07. As is often the case their story does not stack up and I took the trouble to check it out. Following an on line argument with an snp separatist who was trying to sell this nonsense there was the following exchange. Me to him.--- Mr. **** The polls are very sophisticated and mainly accurate particularly when they have been showing a commanding lead for over 2 years. I am delighted with that and of course you would not like to be in the position of the No campaign would you?. You are clearly not worried about making a fool of yourself either are you?. except when they are clearly absolutely completely utterly transparently fundamentally wrong, like the last time the people of Scotland were asked a political question. Clutching at straws comes to mind. I then sent the following. Notwithstanding your rather fanciful claim about the accuracy of the polls I will assume that you have heard of IPSOS MORI who are probably one of the most famous pollsters of them all. The contact I have given you shows the following information from them based on those who were deemed 'certain to vote' in the Holyrood election on May 5Th. 2013. It is as follows. Feb. 16Th. 2013 - 48 days before the election snp 37% Labour 36%. March 22Nd. 20 13 - 34 days later and 14 days before the election - snp 45% - Labour 34% an snp lead of 11% and the result? An snp victory with a lead of 10% not bad eh?. Despite 4 attempts to have this printed the Herald still refuses to print it. I was advised that their refusal might be because they do not advertise other companies or ‘links’ to other sites. I then resubmitted the post minus the reference to IPSOS MORI and removed the link to the other site. They still did not print it!. In terms of the referendum debate, I’m sure you will come to your own conclusion as to whether you can believe what the Glasgow Herald says.